Searching a good job gives a headache, especially to many youngsters; you need to be on top of your game to get the desired result. Searching the right job for you is not the easiest task and people often show leniency in the searching, which often cost them by losing the opportunity. Job searching is the initial step we took toward our professional life and the outcome needs to be good only then you can give a good start to your career. If you are the one who already has a professional life started and want to move to a new level and searching for the job then job search result plays an important role and shows good opportunities. If you are wondering what does good job search result mean and how to improve them, then you should read this article to know the ways to improve job search results. 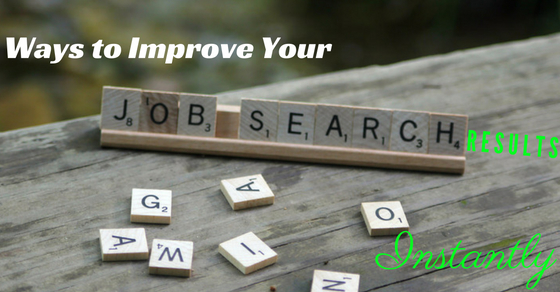 In this article, we are going to discuss the ways to improve job search result. Job search result matters the most if you are a newcomer, changing stream or want a better opportunity to move on because the job you search decides the path of your career. We hope this article will help you in improving job search result as there are many things one needs to put on the stack when starting a job search. Everyone has an expectation for their career, professional life, and growth, this expectation shows in the job search result, but the point is your expectations are under the reachable zone? There is no problem in setting high expectations, but too high expectation may lead you to the disappointment. You need to know your capabilities, limits, and your caliber because that will help you in setting your expectation. Too low or too high both are not good for your career pint of you, especially if you want to improve job search results. Our expectations play very important role in our lives, whether it is personal or professional. Set your expectation on the basis of reality; choose the job field of your knowledge or the field which let you broaden your skills and techniques. Setting realistic expectation is the surest way to improve job search results. Avoid unrealistic expectation and keep track of what you want and what you are offering because the job is a two-way process, you have to be good for if you want a better job. Are you one of those people who never give a second thought about how their resume is a clutter of information but worried about the job search results? If yes, then before you start to worry about job search results first, go through your resume. It is very important to have a well-written resume which has balanced combination of all the information you want to share. Your resume must be good enough to pass the 6 seconds challenge because on an average, a resume got 6 seconds of scrutiny which decide whether it’s going to be accepted or rejected. You must ensure that your resume is up to date with all your achievements and good things about you. Your resume is one of the important keys to improving job search results because a good resume describes clearly that what you are looking for and what you are offering as your service which ultimately improves job search result. Never underestimate a simple paper which has your resume written over it because this is the key and the first step toward success. What is your approach for searching a job? Posted email over job websites and sending mail to the company’s website? You think spending few hours once in a week is enough for job searching? If yes, then you need to review your approach. If it is your only way for job searching then there is no wonder you have a very unsuccessful job search results. Searching a right job is as difficult as clearing an interview, you need to prepare well and work hard. Job searching is a full day working job where you need to work, to meet the desired result. You need to review your approach and then make the necessary improvements. The results depend on the methods and the efforts you are applying, so you strictly need to review your old approach of searching the job as well as make improvements wherever it deemed fit and necessary. You don’t have to spend all your waking minute over it, but set the schedule and prepare before you start searching and make notes at the end. . There is no problem in having high expectations, but the problem is when we set expectations beyond our reach but refuse to accept the failure. We all are human beings and we are prone to make mistakes, then why hesitate in accepting them? A mature person accepts failure with open hands and embrace so that he can learn from it. When we discuss the ways to improve job search result the one thing that seems negligible, but play an important role is setting expectations as per your limits and accepting failure. Everyone face failure more than once in their lifetime, but the people who use their failure as a rock to step up are the real leaders and they get what they want. So to improve job search result accept your failures, learn from them and use them to move ahead. Keep your expectations within your limit and never shy away from failure and hard work. Time is a precious element in anyone’s success. Time hold so much importance and waste of time can cause serious trouble for you, especially if you are starting your career. There is no time which is classified as good or bad, success comes to those who take benefit of every single second and never waste their time over anything less important. The success mantra holds the importance of time very high, so if you are looking for the ways to improve job search results then do not waste time. Understand the importance of time and learn to utilize the time to the fullest. When you start job searching, give it your full attention and never compromise over time you spend over the job searching. Understand your requirements and work according to them, do not waste time over the jobs which have no relevance to you. Categorize your job priority and then work according to them. What is your image in your previous workplace? What is your brand value? Do you know your own value? These are, the question you must ask yourself to know where you stand in this competitive market where there are many options available and some are even better than you. When you start job searching, you must set your brand image because it takes less than a minute for a recruiter to hire in this global village which we call the modern business world. This is one of the important ways to improve the job search results. Set your own brand and professional image because in the time of globalization, recruiter doesn’t have enough time to waste over so many formalities to get to know you. Networking, professional relationships, and social-professional websites are one of the best ways to improve job searching results. In this time of the globalization, one should understand the power of networking, professional relationships and the website which work as a social platform for professionals all over the world. Your good networking skills and professional relationships can do wonders to your job search results as well as can land you your dream job. A website like LinkedIn works as a great platform for networking and provide an excellent way to improve job search results. So, start working on your networking skills, make good professional relationships and refine your LinkedIn profile to improve job search results. Always keep in touch with the people from your previous workplace and maintain a good professional image in your workplace. Setting a goal or aim in life gives you the motivation to achieve something and to give your best, but we human has a tendency to distract from the path if we feel like we cannot do this or the goal we are setting are too high to achieve. Goals are important and setting the right goal is more important, without a goal you cannot achieve anything because of your goals, dreams, and the aim is the motivational factor we all need in our life. There can be another reason to do a particular thing, but without an ultimate goal, we cannot go on for long. But setting a goal is just not enough. Setting goals which you think you can do is a very productive way to improve job search results because now you know what is your ultimate goal and you just need to move in the right direction. But set the goal which is humanly possible and you have the utmost trust in yourself that you will achieve it because unrealistic goals just waste your time, energy and confidence. Are you in one of those people who just head first into the matter without your research? If yes, then it is the habit you need to change immediately because this may be the reason you need improvement in job search results. A good research always helps you in finding the right job, organization and improves your skills. If you are starting your career then a good research about the field you are about to enter, job offer by different organizations and the growth rate of the field can improve job search result as well as you get a better understanding of working. A good time investment in research is a great way to improve job search result because with the research you have a better idea about the job and what you want to do. Good knowledge never goes waste and it helps you one way or another. So, invest your time in good research before you start job searching. Self-analysis is the procedure where you spend time with yourself to get to know your own need, desire, wishes, and dreams better. Sometimes you don’t know what you want for yourself, from your life and from your job which causes a very big mess in your lives. Wrong career path, unsatisfied life, stress, and anxiety are the side effect of not knowing yourself very well. Spending time with your own company is what you need to know yourself because you are the best guide and teacher of your own mind; you are the only one who knows your dreams, desires, and wishes. Giving time for self-analysis is a great way to improve job search result because self-analysis gives you insight about what exactly you are looking for. There is no definite path to follow, but we can use some ideas, some guidance to help us in the navigation. Always make efforts to improve and learn from your mistakes because your mistakes are your greatest teacher. We hope this article helps you in finding ways to improve job search results and you have better outcomes after reading this article.